Danair's Viscount 724 G-BDRC (c/n 52) is seen here taxiing out, sometime in 1978. Must be one of the first photos I took of a civil aircraft, at that time I was more fascinated by military aircraft but I'd started a job at Amsterdam's Schiphol the year before. First flight 20Apr55 - delivered to TCA on 01May55 as CF-TGO. Flew the inaugural Montreal - Vancouver Viscount service on 01Nov55. Last TCA flight was on 06Jan63; total flight hours at that time was 17.995 hrs and 14.743 landings. The aircraft was then withdrawn from use. Sold to W.C. World Associates Inc. on 02Mar64 and re-sold to Air Inter on 02Apr64 as F-BMCG. CofA and Cert. of Registration both issued on 11Jun64. Sold to Alidair on 15Sep75 and delivered to Paris-Orly on 24Oct75. Reregistered as G-BDRC on 09Feb76. Leased to Intra Airways between 25Mar76 and 31Oct77. Transferred to Alidair (Scotland) on 15Nov77. Leased to Dan-Air Services between 27Feb78 and 27Jan79. Leases to ABC, Intra Airways and Guernsey Airlines. Before entering service with Guernsey Airlines the aircraft was refitted with the interior from V.735 G-BFYZ (c/n 69), which had crashed earlier. Operated for Southern Int'l Air Transport in Oct80 and leased to Dan-air 08Sep80 - Oct80. Alidair became Inter City Airlines on 01Mar81. G-BDRC was withdrawn from service and stored at Guernsey on 01Aug83. Sold to Janus Airways on 04Jan84. Late 1984 withdrawn again from use, stored at Exeter. Registration was cancelled 09Oct84. During May 1986 it was reported engineless and a corroded hulk on Manston Airport Fire Dump. Blown over by a hurricane at Manston on 16Oct87 and subsequently broken up. 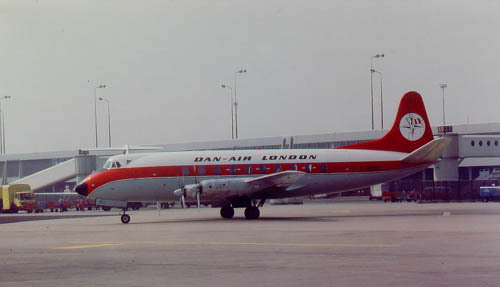 DAN-AIR Services was founded in 1953 by a British shipping agency: Davies and Newman Ltd. Like so many they started with a Douglas DC-3 and their homeplate was Southend. In 1955 the headquarters was moved to Blackbushe and Avro Yorks were introduced. DAN-AIR Engineering, a maintenance subsidairy was set up at Lasham. Routes were flown as far as Africa and even to Singapore. In 1956 scheduled services to Jersey were started. That same year also aid and evacuation flights were in flown in response to the Russans invading Hungary. Bristol 170 freighters were added to the fleet.The market for holiday travel (IT-charters) had emerged and passengers were flown to destinations in Italy, Spain, Belgium and Germany. During the early 1960s the scheduled services had expanded from Bristol and Cardiff; De Havilland Doves and Airspeed Ambassadors had been added to the expanding fleet. DAN-AIR stepped into the jet-age with the introduction of 3 Comet 4Bs in 1967. Later, more Comets were added, but also BAC One-Elevens. Scheduled services expanded to destinations abroad: Belgium, the Netherlands and Norway. Two Boeing 707s were bought for services across the Atlantic. DAN-AIR took over Skyways Int'l in 1972 and operations continued under the new name: Dan-Air Skyways using HS.748s. Dan-air was the first UK operator to use the Boeing 727. They were used to replace the fuel guzzling Comets. Meanwhile Dan-air had developed interests in aircraft handling, catering, leasing, tour operating and sales organisations. Dan-air survived the 1970s recession and the oil crisis and by mid-1980s was carrying over 3.000.000 passengers ! Other types were introduced on th eroute network, such as: Boeing 737-200s, 737-300s, Airbus A300B4s and BAe 146s. British Airways stepped in at the end of 1992 and took over for a symbolic price of UKL 1,-. An illustrious British airline had faded into history. "Dan-Air entered the jet era with two Comet 4s, which they took delivery of in May 1966 (I was at Lasham on the day the first was delivered there by BOAC on 19May66). The aircraft were G-APDK and G-APDO. They entered service in October of the same year, after fitting out with 99 seat all tourist interiors and painting in Dan-Air colours." Airlines Remembered by B.I.Hengi (Midland Pubishing, 2000).